Welcome. I am so happy that you stopped by. My front door is always open to invite you in to sit and relax with a cup of hot tea while I share with you the inspirations for my art. I am painting a whimsical Rooster painting today and would like to invite you to paint a Rooster with me. I have always wanted to have enough land to have a charming little chicken coop, however, I live near the ocean where the lots are small and we do not have room for chickens. Since I do not have any real Roosters to show you, I will show you the Roosters in my kitchen. Bentley, my Studio Assistant, is waiting to bring you inside to look for rooster inspirations in our kitchen. This mosaic tray with the whimsical rooster is one of my inspirations. I have lots of blue and white in my kitchen and am thinking about painting a blue and white Rooster. Fall flowers on patio off my kitchen. The blue Rooster pillow is one of my inspirations for a whimsical painting. My apron has whimsical rooters frockling about. Roosters on my kitchen chandelier. Everwhere . . . . .
More blue and white Rooster inspirations. With all of the blue and white inspirations I am ready to start painting. If you would like to paint along with me you are welcome to copy my sketch. I sketched a very simple Rooster that should be easy for beginners. I paint on canvas, however, you can paint on wood, slate, or anything you want to. I like to base coat the white canvas before I start painting as it is easier to see the sketch. I paint with Liquitex acrylic paints as they are non-toxic. After the sketch, I decide on the background and decide what to paint. .. then lightly paint in the background to get the feel of how it will look . .. by painting with watered down paints it is easy to change the background . Next I paint in the darks - notice I painted in the blues on the body of the Rooster and lightly painted in the feathers to get the feeling of how the Rooster will look with a blue body. Next, I painted in the feathers and darkened up the background. Since the painting is so whimsical with blue feathers, I decided to add some geraniums for the Rooster to stand in - I felt it added another touch of whimsy. Add a tiny white dot to the Rooster's eye. You can paint your Rooster any color - if you want a more traditional Rooster, you can paint the body and tail feathers brown, black or any traditional color. A blue and white rooster. How perfect. I love it when we get to see oyur inspiration and then the finished painting. Everyone should have at least one blue and white rooster. Yeah! The rooster post! I have been waiting for this. Your's turned out wonderful. I am bookmarking this page and if I ever get the nerve, I am going to try this. Thank you! I love your Rooster. He turned out great. The colors are so pretty. Love & blessings from NC! 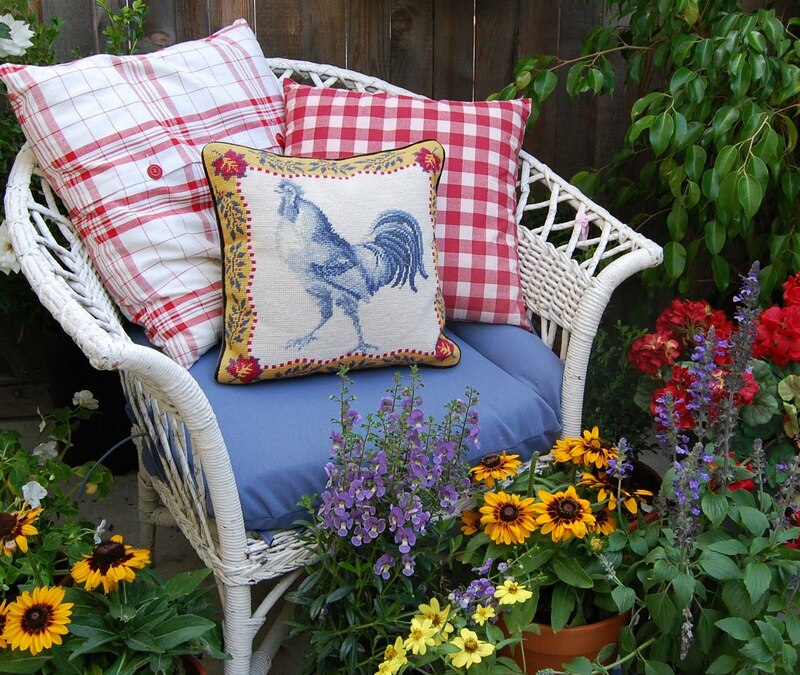 Love your whimsical rooster! That's probably a rooster's dream to be parading around in a beautiful color. Love your rooster Erin...looks perfect in your kithcen too. Have a good weekend. I just love your blog. Visual wonderfulness every post!! I want to see more of your kitchen. Roosters are something I collect too and love to stash them here and there. Beautiful! Love the blue! Happy Pink Saturday. Have a wonderful week! bellissimi colori....e deliziosi i tuoi gerani.home is where the heart is. complimenti per i tuoi lavori. I adore your color pallet! Whenever I come here I feel that aaaah feeling. I love all of your blue and white and I love that punch of red that really makes everything pop. Your rooster is beautiful. Do you license your work, it seem so perfect for art licensing. I can see your rooster on a plate. Speaking of plates that yellow and blue one is fabulous. Erin - Such a special treat to watch as your painting comes to life in vivid colors! Your kitchen is lovely - and I love that you LOVE roosters (was a favorite of my Mother). How wonderfully clever that you take your inspirations from all the things that you love. Your home is beautiful and your artistry only compliments all that is around you. Thank you, thank you, thank you! I love this and am inspired to try a rooster myself! Just got back from the craft store with the paint!! !